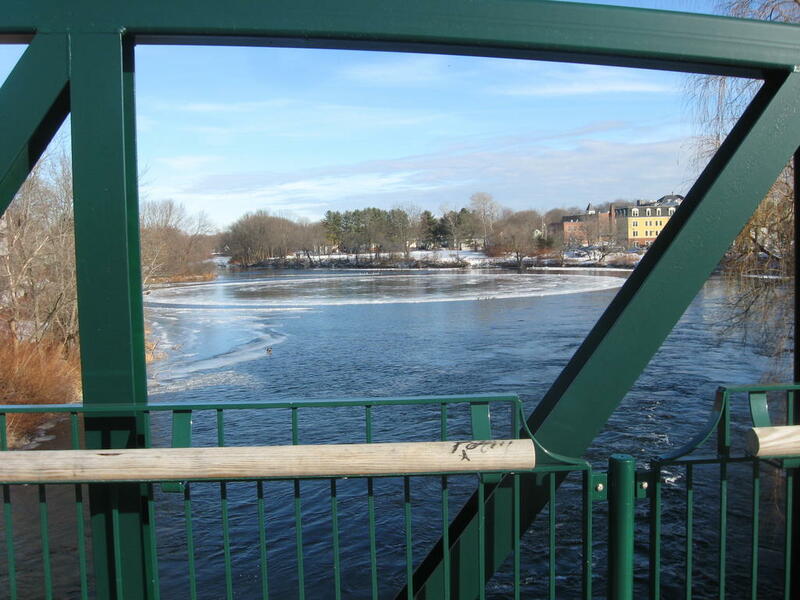 A view from the pedestrian bridge in downtown Westbrook shows the ice disk in the Presumpscot River. The phenomenon has attracted global attention. A steady flow of onlookers flowed into Westbrook Tuesday to see the ice disk for themselves. Michael Lahr of Westbrook prepares to launch a drone Tuesday to catch a bird’s eye view of the ice disk. Westbrook Officer Phil Hebert was on the scene Tuesday to handle traffic generated by onlookers. WESTBROOK — A giant disk of ice spinning in the Presumpscot River drew global attention this week and a steady flow of onlookers downtown. National media descended on Westbrook to report on the unusual but not unheard of scientific phenomenon, and Mayor Mike Sanphy appeared Wednesday on ABC’s Good Morning America. Video of the disk, estimated to be about 100 yards wide and slowly rotating counterclockwise, is all over the internet. The disk appeared to stop spinning Wednesday afternoon, lodged against the riverbank. On Tuesday, a continuous stream of the curious driving into the city jammed downtown streets and caused parking lots to overflow. Westbrook Police Officer Phil Hebert was dispatched to handle traffic control. “They were stacking up,” Hebert said. Portland resident Kathy Foster checked out the ice from the River Walk Tuesday. “It’s the magic of living in Maine,” she said. “It’s mesmerizing,” said Linda Cunning of Westbrook, a new Maine resident. Michael Lahr and several others with drones captured videos and still photos from a bird’s eye view high above the river. Tina Radel, the city’s marketing and communications manager, said she has handled calls this week about the ice disk from media outlets across the country, Canada, the BBC and others. She said most callers asked how it formed. “I’m no scientist,” she said. Paul Nakroshis, associate professor of physics at the University of Southern Maine, told the Portland Press Herald there are a number of theories about spinning ice disk formation. He opts for one the simplest ones: The flow of the river is pushing the ice disk along like a paddle wheel. He suspects the ice forms in clumps, begins to stick together and collects more ice as it goes. The edges appear thicker than the center, Nakroshis said. “Once it starts, something sticks to it and freezes to it and it just keeps growing,” he said. Rob Mitchell, who owns an office building at 17 Ash St. overlooking the river, spotted the disk just before 10 a.m. Monday and notified the city. “There were ducks sitting on it. The ducks were rotating on this big Lazy Susan. It was a big duck-go-round,” he said. The Portland Press Herald contributed to this report. Tina Radel, Westbrook’s marketing and communications manager, used a drone to capture this image of the spinning ice disk in the Presumpscot River.